A simple guide to setting up your first blogging website! Setting up a blog can be the perfect way to share your passion with the world. Whether you’re a chef wanting to show off your culinary creations, or a traveller yearning to share the beautiful sights you’ve experienced, a blog website gives you the perfect platform to showcase your lifestyle and get in touch with like-minded people. Don’t wait for opportunities to come to you – go and grasp them with both hands. The best thing about setting up a blog is that you get total freedom to post about whatever you want, to whoever you want – but no-one is going to take that first step for you – it’s up to you to get off your behind and take control. Knowing where to start can be a touch daunting, especially if you’ve never set up a website before. Here I’ll take you through step by step instructions on setting up your first blog, teaching you the basic items you’ll need to know, before setting you free to create your own little piece of the internet! Firstly, you’ll need to have an idea about the blog’s theme. The fact you’re reading this guide suggests that you probably already have an indication of the kind of website you wish to setup – if you’re undecided, then I’d recommend choosing one of your hobbies or pastimes – an activity that you’re passionate about – as this will encourage you to make regular posts, and help to make the website a success. If you choose a topic that you’re less bothered about, then chances are you won’t feel inclined to update it as often. So now you’ve chosen a topic, I’ll cover the technical side of running a blog. Don’t worry technophobes, it’s very simple to understand – I’ve broken down each stage into bite size chunks to make them easier to digest! You don’t necessarily need to learn any complicated code – editing your website can be as easy as using Microsoft Word – so don’t panic if your computer skills aren’t as advanced as some, this will not hinder you in the slightest. In the blog world, content is king – essentially this means that the actual content of your blog – the text, photos and videos – are far more important than any coding skills you have. 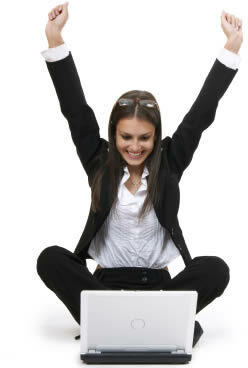 Give people a reason to visit your website, and it will undoubtedly become popular. So how do I name my blog? In order to have a blog online, I would recommend obtaining a domain name. 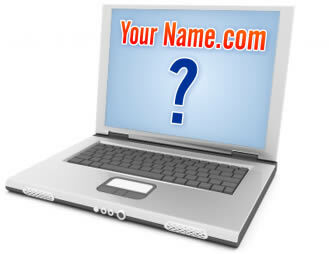 Put simply, a domain name is your own unique web address – such as YourBlogName.com . This is bought for a small annual fee, and will help people to access your website. Ideally you should choose a domain which is short, easy to spell and remember. It should also be relevant to the topic of your blog. For example, if your name is Lucy Smith, and you’re passionate about baking, you might choose something like Love to Bake.com or Cakes by Lucy.com. However I’d recommend NOT to choose a domain such as LucySmithsWebsiteAboutCakeBaking.com simply as it’s far less memorable and more difficult to share by word of mouth. So where do I get a domain name? I’ll answer this within the next section about web hosting! In order to put your website online, you’ll need a service called Web Hosting – this is where your blog is actually stored. Put simply, you pay a small fee to store your website on a computer with a very fast internet connection (this is known as a web server) – so that people worldwide can access your website, day or night. This web hosting service would also include an e-mail address – so instead of a mouthful like lucysmithcakes1985@yahoo.com you could use Lucy@CakesbyLucy.com – which looks far more professional, especially if your blog turns into a business venture. Also included is a free Domain Name (such as Your Name.com – as mentioned above!) – making your life a lot easier, as there will be very little left to setup! If you need web hosting then these guys are worth checking out – I’ve used them for a few websites; they’re reliable, provide unlimited bandwidth and are pretty cheap too. They also include full customer support, so you can either speak to or e-mail a member of staff should you have any problems. They also include a money back guarantee should you decide that you don’t wish to continue blogging anymore. But I don’t want to spend any money, can I start a blog for free? Yes – if money is a little tight, then there are several free options, which can be useful to some users, but not all – choosing this path inevitably has some downsides. Similarly, because you’re not paying for the service, you have a lot less control over how your blog actually looks and works. It’s very difficult to earn money from a free blog – you have less control over displaying adverts, simply as the provider want to make money themselves, usually from your hard work. 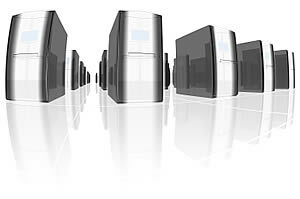 If you pay a web host to store your website, you have a huge choice of free website designs (how your website actually looks) as well as plug-ins (these are free pieces of software which add extra functions to your website – such as online shops and contact forms) – however generally speaking, free blog services do not include these – you’re stuck with a handful of basic website designs and are very limited if you need to customise your blog at all. Some free blogging services also insert annoying adverts on your website, which you won’t be able to remove – free does not always mean free! Keeping the blog free and not suddenly deciding to charge you. Not going bust and leaving you stuck with no website and losing all of your readers forever. They are also very unlikely to provide any customer support as it’s a free service – so if you’re stuck, then they probably won’t be able to help you. That said, if you just need a basic blog to share items with friends and family, then a free version may well be the most cost effective and suitable option. However if you feel your blog will grow, and potentially need room to expand, then I’d recommend paying for a web host. Do I need to buy any blogging software? No – you’re in luck, as there is an excellent piece of free software called WordPress. This blogging software is used by millions of websites worldwide, features thousand of free designs and is totally free to use for bloggers. Once you have paid for a web hosting service, you will be granted access to a control panel, where with a click of a button you’ll be able to set up this software. That’s it – done – you’re ready to blog! Your web host will help step by step instructions on this, as well as free customer support should you have any questions – however it will usually take around 30 seconds from start to finish, and is very user friendly. The best part of WordPress is that it’s incredibly simple to use – you don’t need to know how to code, or any complicated computer languages – using it is as easy as using Microsoft Word – just type and click Save, and your blog will be updated! The WordPress software is stored at the web host – so you don’t need to download any software to your computer either – all you need is a web browser and an internet connection – you can update your blog from any computer in the world, assuming it has access to the internet! Once WordPress is installed, you can choose a design (these are called “Themes” – and there are thousands available, the majority of which are totally free! ), and then you’re ready to start sharing your passion with the world. Quick tutorial here to help those who are being spammed on their blog. To remove the URL field from the WordPress comments form simply open functions.php (found within your theme’s directory) in your favourite text editor and paste the following code to it, immediately before the very last line. Save the file, upload it, and the URL field will have disappeared! Want to add a shortcode directly to a WordPress theme without having to manually add it to each post or page? Supposing you need to use a different shortcode on each post, such as for a Gallery or Product Table. More advanced still – adding custom Shortcodes to each WordPress Post Template! Supposing you need to customise this further, and need to be able to edit the Shortcode variable for each individual post? Essentially whatever you type in the custom field will be outputted within the shortcode on every post or page using that template. This should save you some time from having to add each shortcode manually, as well as giving you more freedom with the post or page layout.